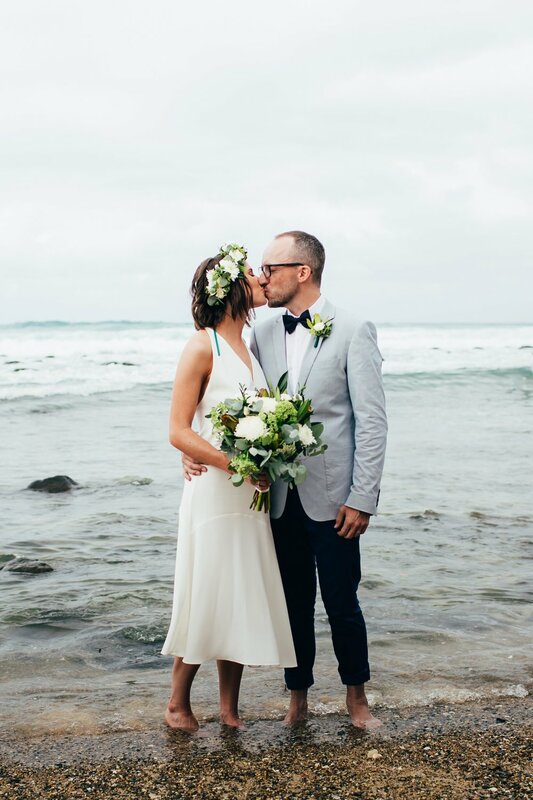 Sarah & Andrew // A beautiful beach wedding ! This funky Gold Coast duo met on the 4th August 2006 at the Powerhouse, Albert Park, Victoria. It was the University watersports cocktail night (which was odd because Andrew no longer attended university and neither of them were involved in any water sports what soever) Andrew immediately noticed Sarah’s calfs (which she thought was weird) and she immediately noticed that Andrew and his friends were WAY past university age. They bonded over a mutual love of Billy Joel, Elton John, The Rolling Stones and Beatles. They exchanged numbers and had a date not too long after. 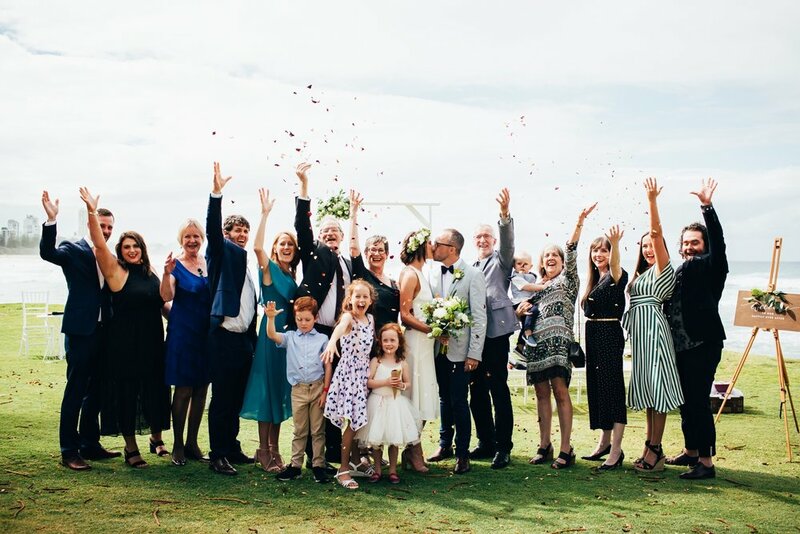 Fast forward 13 years and a baby later they decided to get married at the beautiful Burleigh Beach in the John Laws Park on the 16th of March 2019. Normally this location offers views all the way to Surfers Paradise but the overcast weather provided the perfect backdrop for their wedding with the buildings in the distance just poking through. With love in her heart and flowers in her hair. 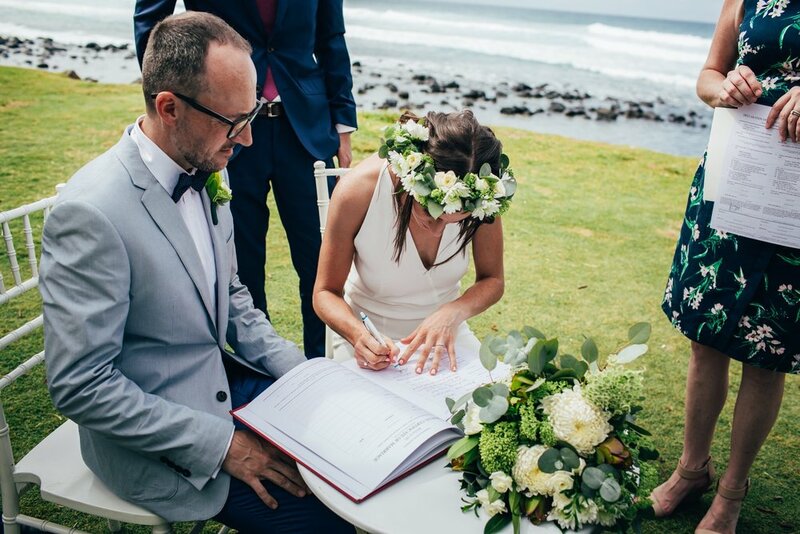 Sarah looked amazing in her Leaf en bloom flower crown with matching bouquet. Flower crowns are the perfect alternative to the traditional veil. They bring a fresh, natural beauty to your bridal look and really stand out in your wedding photos.